I’m celebrating my riveting Reviews and interviews for Song Bird Superhero! 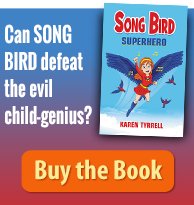 From teeniest girl to most respected magazine, check out book reviews for Song Bird Superhero. Pinch Me! I can’t believe what they said about my empowering children’s fantasy adventure. Amazon launches Song Bird Superhero across the World. On Saturday I launched Song Bird Superhero at Logan North Library as a interactive pantomime to a crowd of kids and grown-ups. 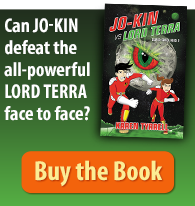 JO-KIN is a hilarious space adventure empowering kids to live strong with resilience, teamwork and HUMOR. I’m doing cartwheels! 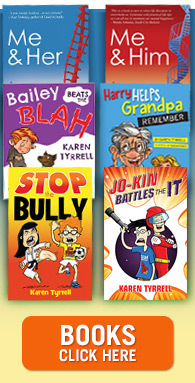 Bailey Beats the Blah will be showcased at the Bologna Book Fair March 24-27 in Bologna Italy. International book buyers will read the pages of Bailey displayed at the SCBWI stand for Australian and New Zealand authors. DRUM ROLL: Announcing #10 FREE Giveaways of Me and Her across the globe > Enter on this page below.